It’s definitely a fun little idea that always ends with a smile. How could you not smile when you open a box full of delicious snacks? 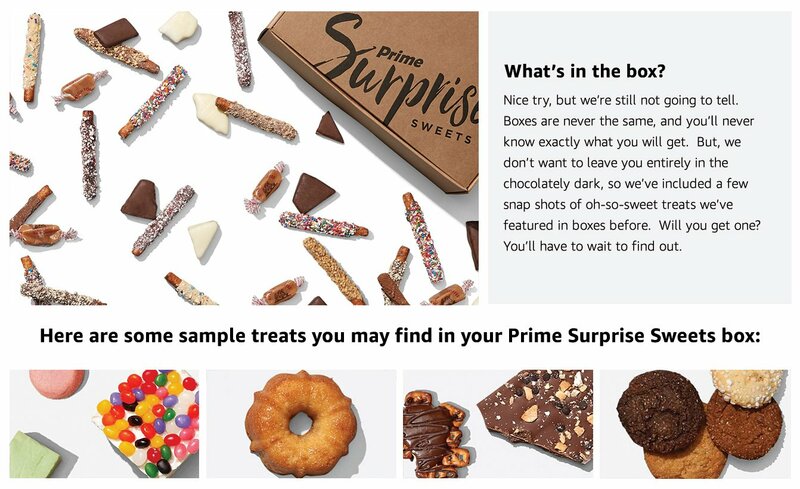 The Prime Surprise Sweets is always a good value at $18-$20, but today it’s Amazon’s deal of the day so it only costs $14.40. Go ahead — enjoy the surprise. A curated box filled with at least four surprise (yes, surprise) full-sized selections of top-notch sweets. Available to eligible Prime members with FREE standard shipping in the contiguous 48 states. Products may contain milk, eggs, tree nuts, peanuts, wheat, gluten, and/or soy.